Would you like to fly via the Business Class when you got a ticket for the Economy accommodation? Then check on myPAL Upgrade. Philippine Airlines just announced their latest service innovation, the myPAL Upgrade! Thru this, passengers now have the chance to request for an upgrade from Economy flights to Business class. 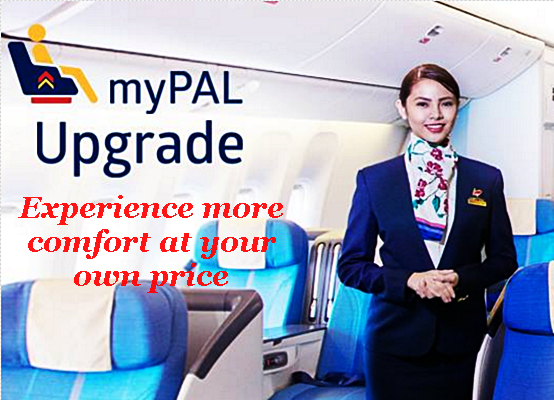 Passengers with myPAL Upgrade flights will have the same benefits and perks as full paying business class clients. The benefits for PAL business class are: additional baggage allowance, dedicated check-in and priority boarding, premium amenity kits, relaxing in the Mabuhay/VIP lounge prior to your flight, various menu choices, on-in demand flight entertainment and the usual perks of a business class accommodation. Aside from the above, upgraded passengers will also get PAL business mileage accrual for trips until August 31, 2016. AUCKLAND, BALI, BANGKOK, BEIJING, BRISBANE, CAIRNS, CANTON, DARWIN, FUKUOKA, GUAM, HANEDA, HONGKONG, HONOLULU, JAKARTA, LONDON, LOS ANGELES, MACAU, MELBOURNE, NAGOYA, NARITA, NEW YORK, OSAKA (KANSAI), PORT MORESBY, SAIGON, SAN FRANCISCO, SHANGHAI, SINGAPORE, SYDNEY, TAIPEI, TORONTO, VANCOUVER and GUANGZHOU (JINJIANG). This PAL feature will include the Middle East routes and domestic flights in the future. Passengers may submit their upgrade bids up to 36 hours prior to their flight schedule via e-mail to Philippine Airlines technology service provider PLUSGRADE by clicking myPAL Upgrade link. Visit myPAL Upgrade page in the Philippine Airlines website: www.philippineairlines.com. Passengers may check if they can bid for a better seat by entering the flight reference number and last name. Pre-determine minimum and maximum fare rate are detailed for each destination. Encode your credit card number- the charges will be only applied when the upgrade is awarded. Review for the correctness of the information you keyed in and submit your upgrade offer. Successful or not, a bidder will be notified regarding the result of their upgrade for not less than 24 hours prior to scheduled departure. LIKE and FOLLOW us on Facebook at PISO FARE TICKETS for airline updates, Promo Fare, and PISO FARE!